Published in The Saturday Evening Post in 1943, Norman Rockwell’s artistic interpretation of President Franklin Delano Roosevelt’s Four Freedoms became a nationwide phenomenon and a patriotic symbol of support for the war effort. This particular image, titled Freedom From Fear, depicts a white family of four in a child’s bedroom, saying goodnight. The father, dressed in grey pants, a white shirt, and a blue tie, stands in the middle of the painting. His posture is slightly slumped, suggesting a long day of work at the office; his job is reflected in his clothing. He holds a newspaper in his hand with the headline “Bombings…Horror Hits,” referring to The Blitz (1940-1941), a Nazi bombing tactic designed to break British morale and lead to surrender. However, his temporary disregard for the paper suggests that he has paused to soak in the children’s dual innocence and vulnerability. The man’s face is caring as he looks down upon his children, yet lines of worry are also prominent. Directly behind him, the children’s mother, garbed in a blue skirt and black sweater complemented by a white apron, leans forward to tuck her children into bed, her body entirely absorbed in performing this action. In contrast to her husband, her face appears less hardened by worry; the sight of her children warms her visage. Only the heads of her son and her daughter are visible as they sleep peacefully under the eye of their parents, unaware of the outside world. They lie beneath white sheets, which serves to both emphasize their childish features and create a feeling of security. In the lower right hand corner of the work, a doll has been left on the floor and appears disheveled as if she has been forgotten or thrown from the bed; this imagery not only hints at the horrors of that children underwent as a result of World War II (1939-1945) but also serves to disturb the idealistic tranquility of the bedroom. In the upper right hand corner of the painting, the door leading to the rest of the house is open and the light of the stairwell provides a sharp contrast to the rest of the room; inside the bedroom, the darkness provides a sanctuary for the family while the presence of the light of the hall reminds the viewer that reality can only be temporarily avoided. Franklin D. Roosevelt, the 32nd President of the United States, began the four terms of his presidency by touching upon the theme of fear during his inaugural address of 1932, uttering the infamous line “There is nothing to fear, but fear itself,” a statement that inspired much of his work in office. President Roosevelt first pursued a policy of non-interventionism, particularly through his Good Neighbor Policy (1933) in which he promised to work towards cooperation with Latin America through trade rather than military force. However, in 1939, Nazi Germany invaded Poland and by 1940 had overrun France, Belgium, and the Netherlands; FDR soon called for reversal in US policy and began to rally support for the war. On January 6, 1941, Roosevelt addressed Congress, delivering what is now known as the Four Freedoms Speech. The president chose his words carefully, calling for freedom of speech, freedom of worship, freedom from want, and freedom from fear, and declared them to be principles that the free world must strive to institute and protect. However, his speech did not receive much traction in the public due to widespread support for American isolationism. Nearly a year later, on December 7, 1941, the Empire of Japan launched an attack on a naval base in Pearl Harbor, Hawaii, leading the United States to enter WWII the next day. The following year, Norman Rockwell, an artist who illustrated covers for The Saturday Evening Post and later for Look Magazine, drew inspiration from FDR’s Four Freedoms and created rough sketches of the president’s vision. He submitted them as posters for wartime propaganda to the Office of War Information, who rejected them due to an inability to finance the project. On his return trip home to Stockbridge, Massachusetts, he stopped at the office of the editor of The Saturday Evening Post who received his drawings with enthusiasm and decided to publish the final versions. Rockwell’s work on these illustrations spanned seven months, with the final one, Freedom from Fear, being published on March 13, 1943. Each work was accompanied by a short essay by a well-known author that spoke to the theme of the freedom. The images became incredibly popular, appealing to classic American values, especially as Rockwell was influenced by small town life, saying that he “felt what people needed was some understanding of how these ideals applied to their own lives.” The government turned them into posters, accompanied by the words “Buy War Bonds” and “Ours…to protect” in order to further highlight the message. The paintings went on a tour of 14 cities and raised 133 million dollars in war bonds, aiding the war effort. They became a symbol of hope and a testament to the role that the US would play in spreading these values throughout the world. In his 1941 address to Congress, Roosevelt defined freedom from fear as a “worldwide reduction of armaments…no nation…[can] commit an act of physical aggression against any neighbor,” applying it to international affairs as it was pertinent to the war raging in Europe and Asia at the time. However, his lofty ideals did not provide a platform for the average American to connect to them, as people were more concerned with their own affairs rather than those of democracy and civilization. Rockwell, who was more attuned with the general public, recognized this challenge. 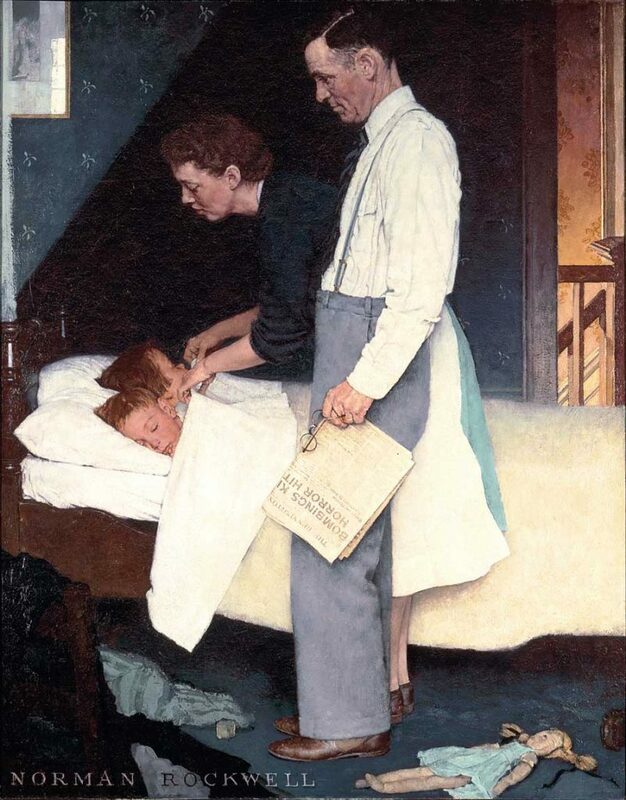 In Freedom from Fear, the domesticity of the children’s bedroom created a way for average Americans to connect through pulling inspiration from the value of family; Rockwell used the propaganda strategy of plain folks, meant to reflect that the people in the scene could be anyone. However, because The Saturday Evening Post did not allow Rockwell to include people of color in his images, unless they were in a subservient role, the majority of his work during the war represents an only-white perspective, leading to the exclusion of many. African Americans, Asians, and other minority groups did not have a place in this idealized version of FDR’s Four Freedoms, an absence that only serves to exemplify the singular dialogue of the period. Rockwell’s depiction of Roosevelt’s Four Freedoms has served as a catalyst to begin a dialogue in both society and the art world, with modern day artists recreating the messages using 21st century scenes. Edel Rodriguez, an immigrant from Cuba, reimagined Freedom From Fear, by replacing the white family with one of Latino origins in a detention center, a more ominous scene. Although the international community has worked to protect global peace, many have not considered the need to protect the lofty ideal of freedom from fear within the borders of the United States. Minorities are not safe from rising nationalist and white supremacist groups who have begun to use their platforms to restrict rights and strike terror into the hearts of US citizens. Without cooperation, regardless of people’s diverse backgrounds, it is impossible to achieve the freedoms that Franklin D. Roosevelt outlined and Norman Rockwell brought to life. A&E Television Networks. “Franklin D. Roosevelt Speaks of Four Freedoms.” History. Accessed July 11, 2018. https://www.history.com/this-day-in-history/franklin-d-roosevelt-speaks-of-four-freedoms. Benét, Stephen Vincent. “Stephen Vincent Benét’s ‘Freedom from Fear. '” The Saturday Evening Post. Last modified January/February 2018. Accessed July 12, 2018. http://www.saturdayeveningpost.com/2017/12/21/in-the-magazine/stephen-vincent-benets-freedom-fear.html. Clinton, Hillary. “Campaign Launch Speech.” Speech, June 13, 2015. Time. Last modified June 13, 2015. Accessed July 11, 2018. http://time.com/3920332/transcript-full-text-hillary-clinton-campaign-launch/. Four Freedoms Park Conservancy. “The Four Freedoms.” Franklin D. Roosevelt Four Freedoms Park. Last modified 2018. Accessed July 12, 2018. http://www.fdrfourfreedomspark.org/overview/. “Four Freedoms: Preparing for War, Envisioning Peace 1939-1941.” FDR Four Freedoms. Accessed July 11, 2018. http://fdr4freedoms.org/four-freedoms/. The New York Times (New York City). “Boomerang is Seen in ‘Fear’ Freedom.” October 11, 1943, 28. https://search.proquest.com/hnpnewyorktimes/docview/106715075/6AFD952C67B14BC7PQ/7?accountid=33982. The New York Times Company. The New York Times. Last modified March 8, 2018. Accessed July 12, 2018. https://www.nytimes.com/2018/03/08/arts/new-york-historical-society-norman-rockwell-four-freedoms.html. “Norman Rockwell’s Four Freedoms.” Norman Rockwell Museum. Accessed July 11, 2018. https://www.nrm.org/2012/10/collections-four-freedoms/. Perry, Patrick. “Norman Rockwell’s Four Freedoms.” The Saturday Evening Post. Last modified January 2009. Accessed July 11, 2018. http://www.saturdayeveningpost.com/2009/01/01/art-entertainment/norman-rockwell-art-entertainment/rockwells-four-freedoms.html. Perry, Patrick. “Rockwell’s Four Freedoms.” The Saturday Evening Post. Last modified January/February 2018. Accessed July 12, 2018. http://www.saturdayeveningpost.com/2018/01/05/in-the-magazine/rockwells-four-freedoms-2.html. Plunkett, Stephanie Haboush, and James J. Kimble. 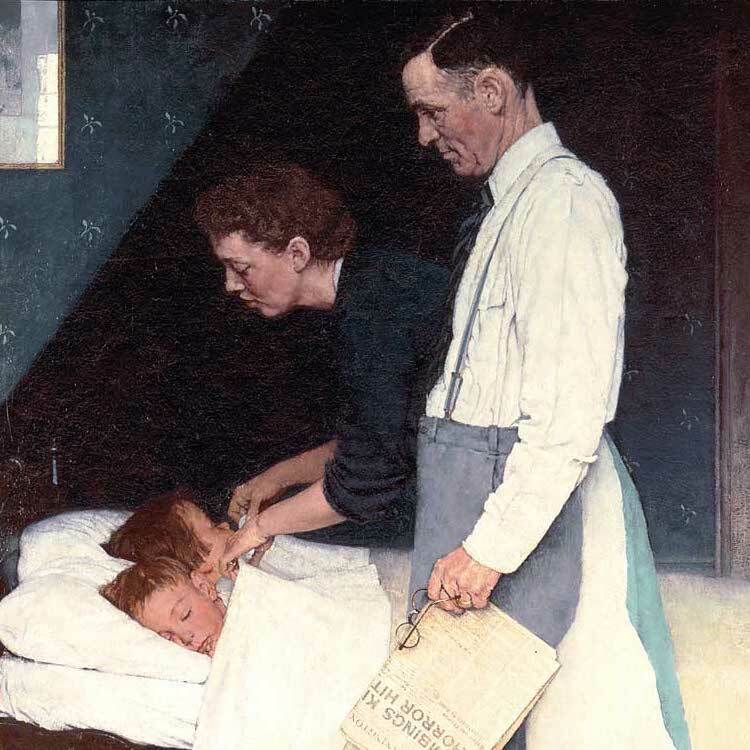 Enduring Ideals: Rockwell, Roosevelt and the Four Freedoms. New York: Abbeville Press Publishers, 2018. Rockwell, Norman. Freedom From Fear. 1943. Oil on Canvas. Norman Rockwell Museum, Stockbridge, MA. Accessed July 11, 2018. https://www.nrm.org/2016/11/freedom-fear-1943/. Roosevelt, Franklin Delano. “Message to Congress.” Speech, January 6, 1941. FDR Library. Accessed July 11, 2018. https://fdrlibrary.org/documents/356632/390886/readingcopy.pdf/42234a77-8127-4015-95af-bcf831db311d. Suri, Jeremi. The Impossible Presidency: The Rise and Fall of America’s Highest Office. New York: Basic Books, 2017. Tucker, Abigail. “A 21st-Century Reimagining of Norman Rockwell’s ‘Four Freedoms'” [Smithsonian]. Smithsonian Magazine. Last modified March 2018. Accessed July 11, 2018. https://www.smithsonianmag.com/arts-culture/21st-century-reimagining-norman-rockwells-four-freedoms-180968086/. Zeitz, Josh. “How FDR Invented the Four Freedoms.” Politico Magazine. Last modified July 4, 2015. Accessed July 11, 2018. https://www.politico.com/magazine/story/2015/07/roosevelt-four-freedoms-119728.